Rockstar wants to wish Grand Theft Auto 3 a happy tenth birthday by releasing it for Android and iOS. It's strange to think that Grand Theft Auto 3 was released just under ten years ago. 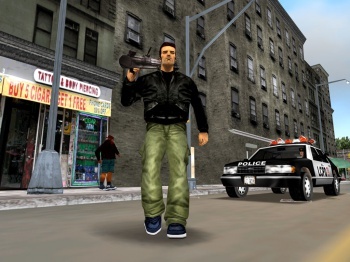 Many of us will have happy memories of roaming the streets of Liberty City, of stealing a favorite car and then switching the radio to Double Clef FM to give a classy edge to the destruction that the open city invited you to wreak. To celebrate the tenth anniversary of its release and remind us all of just how far technology has come in the past decade, Rockstar has announced its intention to release Grand Theft Auto 3 for many Android and iOS phones and tablets later this month. "Grand Theft Auto III showed us the potential of open world games," said Rockstar co-founder Sam Houser. "It helped set the vision for the company, and we have been expanding on those possibilities with every game ever since." Rockstar will also release a limited edition figurine of main character Claude, available in either his classic bomber jacket or his old school Liberty City Penitentiary jumpsuit. Both are available for pre-order on Rockstar's website. GTA3 was a watershed moment for open-world games. Many of the things we now take for granted in our sandbox titles - realistic maps broken up by water or terrain, in-game media, variable police attention, armored tanks - can be traced back to the story of the silent criminal left for dead in a city that never took itself too seriously. Many of the game's greatest achievements lay in its detail; the way the radio news would retell the story of your latest mission, for example, or how you'd have to drive all careful and slow after a visit to the Pay N Spray. The fact that all of this can now fit onto a phone is playing with my mind a bit, but the chance to revisit and celebrate this baby classic is something to look forward to.